Lit by reflected light from Saturn, Enceladus appears to hover above the gleaming rings, its well-defined ice particle jets spraying a continuous hail of tiny ice grains. The fine particles coat the moon in a mantle as white as fresh snow and populate the torus, or doughnut-shaped E ring in which Enceladus resides. 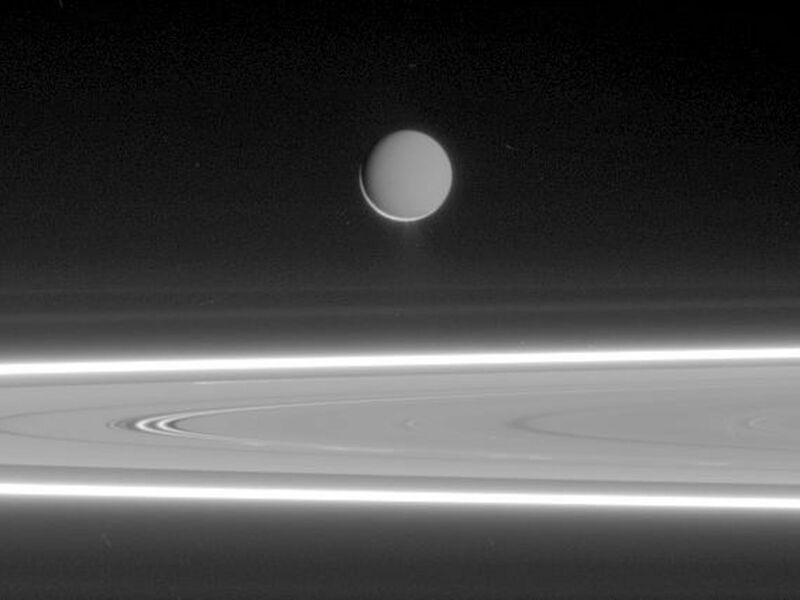 Beyond Enceladus (505 kilometers, or 314 miles across), the fine particles in Saturn's other rings also glow brilliantly in scattered light in this viewing geometry. Running horizontally across the center of the image, between Enceladus and the dazzlingly bright F ring, are two faint rings -- kin of the E ring. These are the G ring (top) and the recently discovered ring designated R/2006 S1 (bottom), which is also unofficially known as the Janus/Epimetheus ring. This image was taken in visible light with the Cassini spacecraft narrow-angle camera on March 22, 2006, at a distance of approximately 1.303 million kilometers (810,000 miles) from Enceladus and at a sun-Enceladus-spacecraft, or phase, angle of 160 degrees. Image scale is 8 kilometers (5 miles) per pixel.